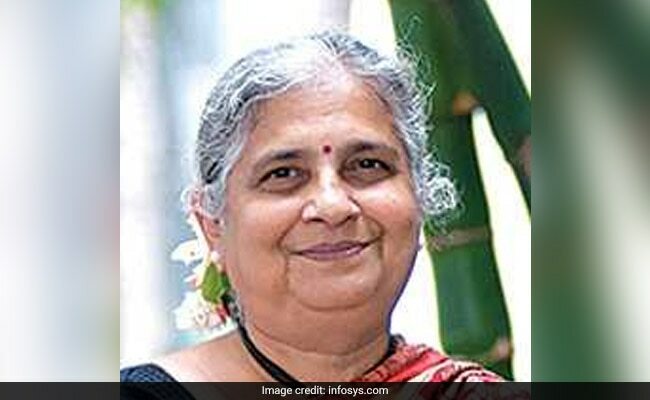 When philanthropist-author Sudha Murthy decided to sponsor a child’s education little did she know that the student, though unintentionally, would end up teaching her a big lesson on honesty. Hanumanthappa, academically bright, “pale” in complexion and financially poor, first caught Ms. Murthy’s attention when she saw his photograph in a newspaper for securing eighth rank in class 10th board examinations in Karnataka. “He was frail and pale, but there was an endearing sparkle in his eyes. Hanumanthappa was a coolie’s son, the oldest of five children. His father, the sole breadwinner earned only Rs. 40 a day,” writes Ms. Murthy in her new book ‘Here, There and Everywhere’. The lack of money forced the teen to quit studies after 10th, she writes. With a piqued interest in the boy’s education, Ms. Murthy invited him to her office in Bengaluru and offered to pay for “any course of study he wishes to take up –wherever it maybe”. However, the “tribal” boy’s definition of “wherever” was geographically limited at best, and with the world of options to choose from he managed to zero in on the Teachers’ Training College in Bellary, one nearest to his house in Rampura. And, his demand for expenses was a meagre Rs. 300 per month. Ms. Murthy’s further pitch for taking up “any course” at whatever fees failed to make any difference to his decision. “He planned to take a room on rent and share it with a friend. The two boys would cook for themselves in order to keep their expenses down. “I sent him Rs. 1,800 to cover his expenses for six months,” Ms. Murthy said. While Hanumanthappa’s story of choosing to study at such a small budget calls for applause, there was more to the boy’s humility than what first appeared to Ms. Murthy. Before long the author received an envelope from Hanumanthappa which had some currency notes along with a letter. “Madam, I was not in Bellary for last two months. One month our college was closed for holidays and during the next month, there was a strike. “My expenditure during these months was less than Rs. 300 per month. Therefore, I am sending you the Rs. 300 that I have not used,” the letter read. Needless to say, Ms. Murthy, the chairman of Infosys Foundation, was overwhelmed by the boy’s honesty. “In my work, 80 per cent of the time people cheat, they run away with money, they lie but there are good things too. And I choose to write about the good and positive things. “Like in this case, the boy knew I expected no account of the money sent to him for his monthly expenses, yet he returned the balance amount. Unbelievable but true!,” Ms. Murthy told PTI in an interview. Published by the Penguin Random House, ‘Here, There and Everywhere’ is a compilation of her best-loved stories along with two new stories.